KFC the day before inauguration. The pic suggests that it has a underground parking. Sundar sir, is it? 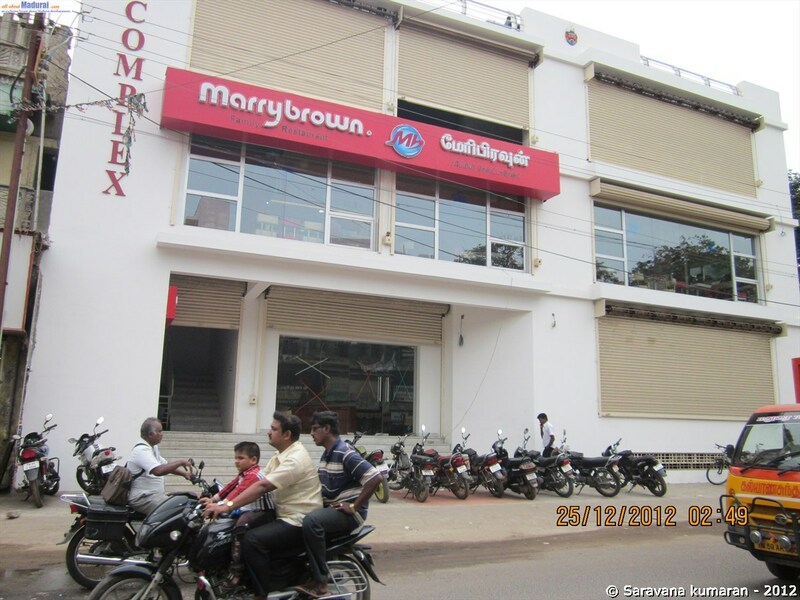 The third MarryBrown restaurant of Madurai in Vadampokki street. Looked to be of a good size. But void of a good parking, but the adjacent Naicker new street won't be having much of traffic, hence it won't be a problem. Yes they have underground parking (which is common for all floors). But by-pass road never having parking problem. Good to note this. Hope some KFC come up in the other areas as well. Looks like the Fun Zone in Milan'em has opened two or three days back. Fun zone in Milan'em open. Any pictorial updates on that? Yeah MK...Went to Milan 'em Mall yesterday. X-CentriK game zone opened at fourth floor. Nearly 25 Play stations & X Box stuffs have been installed. Unlike other funzone at Vishal de which occupies more space. This kind of next 'gen play stations doesn't require such huge space. This type of Virtual game is also started at "Vishal De" also but with limited numbers. Here is a new addition to the list of hangouts in town. A hi-tech game zone opened at Milan’em Mall, offers a thrilling gaming experience to city’s denizens. X-Centrik, built over 2100 sq.ft on the fourth floor of the mall houses exclusive gaming zones for kids, adults and teenagers. Says Managing Director A.Premkumar, “X-Centrik aims to combine playing and intelligence so that children spend quality time having fun and learning. It’s an edutainment concept.” He says the inspiration to start a gaming lounge in Madurai came from his visit to Disney Land in US. Every game is customized and updated periodically. There are also educational games based on Discovery and National Geographic programmes. “These games are sourced from all over the world. I have been working for a year to set up the gaming lounge,” says Premkumar. “My intention is to work with schools. Fun-learning should be encouraged as part of the education system. Visual media learning is a famous concept abroad.” He points out that at X-Centrik, kids below 13 years are not allowed to play shooting games involving violence. For car-racing freaks, there is an exclusive virtual Ferrari zone that gives a realistic feel of driving a Ferrari. “The steering rings, the gear and clutch are miniature replicas of the real Ferrari,” informs Premkumar. Sports games like virtual bowling alley are finding fancy among teenagers and adults. Traditional gaming enthusiasts go for Play Station, X-Box or Avengers. “Madurai is getting modern. Even middle-aged mothers are playing video games these days. We also have membership options for regular players,” says Premkumar. For families desiring privacy, the game zone also features a 350 sq.ft family lounge where a group or family of 12 members can enjoy their games. Premkumar adds, “There are extra games loaded in the machines here. Families may book the lounge an hour before. They will also be assisted by an exclusive helper.” X-Centrik charges Rs.80 for 30 minutes of gaming and Rs.150 for an hour. The family gaming lounge can be booked for one hour at the cost of Rs.3000 and for two hours at Rs.5000. The zone is also rented out for parties on weekdays. At last celebration dates & Logo have been finalized for first edition "Ma Madurai Potruvom" ("Celebrate Madurai"). Henceforth this festival will be celebrated every year on the month of February. Three days celebration starts on Feb 08 2013 and comes to end on Feb 10 2013. Day one starts with Marathon & Igniting of "Festival deepam" with Festive torch collected from various historical monuments in & around Madurai. As a sign of declaration of "Celebration starts". Day two, Starts with Symposiums, Conferences & competitions for schools & college students based on Madurai history. Third day ends with Rally explaining the "Glory of Madurai", Cultural events, Huge gathering of public at Vaigai river Bank with Cracker show on nights sky. Honb'le Collector Anshul Mishra also added discussion is going on for announcing local holidays during festival. Thanks to our Collector & Mayor for such good initiation for our Oldest living city of India. The ecological park, developed by Madurai Corporation near Anna Maligai, is all set to sport a new look as renovation works to the park have been initiated. The facelift was ordered after a visit by the mayor and commissioner of Madurai corporation. They have ordered for a team led by an assistant commissioner, to carry out the works which is planned to be completed in the month of April. The park, adjoining the corporation building, which is spread in 5.5 acres of land was constructed in two phases. It was opened for the public after the inauguration of works in the second phase in the year 2004. The park was set up at a cost of Rs 40 lakh. Boating facility in a concrete tank, illuminated optic fibre trees and fountains are the attractive features of the park. The sprawling eco park with lush green cover which is open only during the mornings and evenings was a most preferred place for walkers, as it has a 2.5-km walking track with an entry provided on Alagarkovil Road. Since the park was established in one of the important places of the city, it attracts a large number of people. In due course of time, the park started loosing its sheen due to slackness in the maintenance. When V V Rajan Chellappa, mayor and R Nanthagopal, commissioner, Madurai corporation inspected the park, they ordered for its revival. The mayor ordered replacing of the defunct electrical bulbs with new ones and for the better maintenance of artificial water falls and illuminated fibre trees. The better maintenance of dancing water fountains and the children's park were also ordered during the visit. The green park will sport a new look with attractive flowers as the mayor has ordered for decorating it with flowering plants. The concrete tank has also been ordered to be maintained properly. Visitors can enjoy the boat ride again in the park once maintenance works are completed in the stipulated time. opening time of Eco park??? 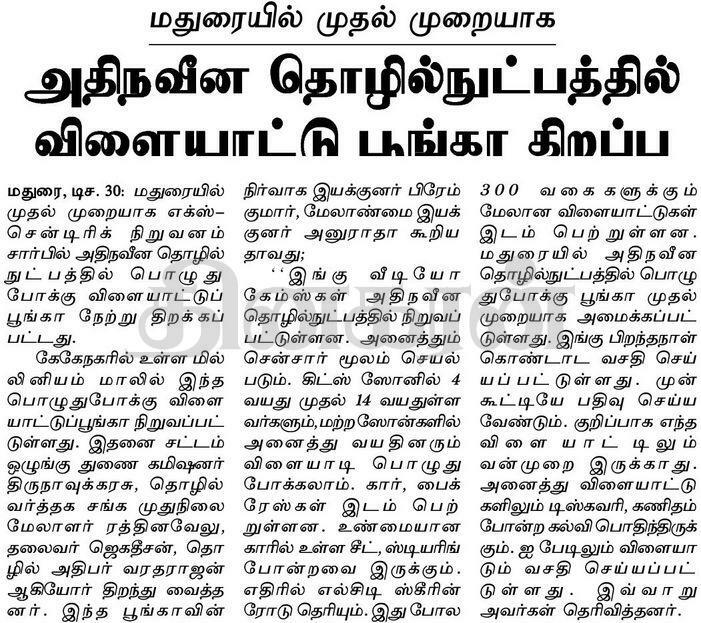 மதுரை மாவட்டத்தில் ஆண்டுதோறும் சித்திரைத் திருவிழாவை முன்னிட்டு செய்தி-மக்கள் தொடர்புத் துறையின் மூலம் தமிழக அரசின் அரசு சித்திரைப் பொருட்காட்சி நடத்தப்பட்டு வருகிறது. அதைப்போலவே, இந்த ஆண்டு வருகிற 20-ந்தேதி பொருட்காட்சி தொடங்குகிறது. தொடக்க விழாவில் அமைச்சர் செல்லூர் ராஜீ தலைமையில் அமைச்சர் ராஜேந்திரபாலாஜி பொருட்காட்சியை தொடங்கி வைக்கிறார்கள். தமிழக அரசின் டெல்லி சிறப்பு பிரதிநிதி எஸ்.டி.கே.ஜக்கையன், மதுரை மாநகராட்சி மேயர் ராஜன்செல்லப்பா, மதுரை வடக்கு சட்டமன்ற உறுப்பினர் ஏ.கே.போஸ் ஆகியோர் முன்னிலை வகிக்கிறார்கள். இந்த அரசுப் பொருட்காட்சி தொடக்க விழாவில் அரசு சார்பில் அரசுச் செயலாளர் (தமிழ்வளர்ச்சி, அறநிலையங்கள் மற்றும் செய்தித் துறை) ராசாராம் விளக்கவுரையும், செய்தி மக்கள் தொடர்புத்துறை இயக்குநர் குமரகுருபரன் நன்றி கூறுகிறார்கள். தமிழ்நாடு குடிநீர் வடிகால் வாரியம், கோ-ஆப்டெக்ஸ், ஆவின், மதுரை மாநகராட்சி, தாட்கோ போன்ற துறைகள் மூலம் அரங்குகள் அமைக்கப்பட்டு வருவதை மாவட்ட கலெக்டர் அன்சுல்மிஸ்ரா நேரில் சென்று பார்வையிட்டு சம்பந்தப்பட்ட துறை அலுவலர்கள் தொடக்க விழா நாளுக்கு முன்பாக அனைத்து அரங்குகளும் தயார் நிலையில் வைத்திருக்க வேண்டும் என சம்பந்தப்பட்ட துறை அலுவலர்களுக்கு உத்தரவிட்டார். அரசுப் பொருட்காட்சியில் அரசுடைய திட்டங்களை விளக்குகின்ற வகையில் மாதிரிகள், விளக்கப்படங்கள் மற்றும் சிறுவர்களுக்கென்று பல்வேறு வகையான பொழுதுபோக்கு அம்சங்களுடன் கூடிய அரங்குகள் அமைக்கப்படவுள்ளது. இவற்றை பொது மக்கள் பார்த்து அரசுடைய திட்டங்களை அறிந்து பயன் பெறுமாறு அவர் கேட்டுக் கொண்டார். Another fried chicken restaurant opening on 13-December. The unswerving stillness of the jungle is broken only by the faint rumbling of our car. The light is falling, stars line up on the horizon as I and three of my friends drive from Masinagudi to Mudumalai. We hear the gentle jingle of the Mayar River winding its way like a giant serpent through a deep gorge parallel to the road. Massive trees with scraggy canopies on either side, cast ghastly silhouettes against the dusky sky. Flocks of birds return to their nests. Giving us company is a lone Malabar Whistling Thrush that’s still out hooting happily. Suddenly, we hear a rhythmic knocking sound echoing through the desolate forest. The jungle is always a riddle and we are partly excited yet scared as to what lies ahead. Just then, we spot a colourful bird pecking at the bark of an oak tree. Wearing the autumn yellow in its wings and the crimson of the morning son in its feathery crest, the Flameback Woodpecker is busy knocking the tree trunk. We admire our first sighting for the day until it flies away. A troop of Grey Langurs leads us on the road briefly and then swiftly hops on to tree tops, becoming fur balls perched on branches with their frizzy tails dangling like epiphyte shoots. In a clearing amidst the bushes, we see a family of Chitals busy grazing. The antlers of few males in the herd glitter in the setting sun. Surprisingly unperturbed, they strike candid poses for us before disappearing into the undergrowth. Further ahead, we come across signboards with images of giant tuskers and words of caution in neon red, announcing elephant crossings. The nippy evening wind howls menacingly, punctuating the air laden with a heavy grassy smell. The road is soiled all over with elephant dung, strewn with leaves and trampled lemon grass and huge circular footprints dot the soggy murk on the sides. As silence befalls again, we hear the breaking of twigs and the creaking of bamboos. We start perspiring even as the chill breeze brings the smell of the pachyderms. But our elephant sighting doesn’t happen yet, though they are very much in touching distance. The bamboo thickets shield the massive beasts, leaving us in suspense and dread that we may have a rather unpleasant jumbo encounter. More chitals, birds, a lone jungle cat and a pair of Sambhar deer keep us engaged in the meanwhile. We take in the landscape of the nearly dry semi green escarpment of Masinagudi that gradually merges with the green sholas of the Nilgiris. Layers of thorny shrubs, tall trees, shallow valleys and rounded peaks weave a tapestry of light and dark shades of green and brown. However, our watchfulness comes handy as we unexpectedly see a pair of glistening tushes protruding out of the bushes just a few yards away. Our hearts race, we freeze and our car comes to a grinding halt. Maintaining a safe distance, the photographer in our team, George Varghese Kodiyatt calibrates camera settings to capture the event in falling light. In few minutes that seemed like an eternity, the much-awaited moment becomes a reality. A pair of pillar-like legs steps on to the road gingerly, pausing for a moment the beast gives us a glance, the glint in its eyes warning us and the road gets blocked by the colossal figure of the elephant as it marches across. Before we could even realize the event, it gets over in a jiffy and we only see the tail vanishing into the thickets on the other side. Later, looking at the blurred images in the camera, we realize how unpredictable moments in the wild are. Hoping a second chance, we retire for the night before returning on a morning safari in the forest van. Mornings in Mudumalai come alive with bird songs and the calls of animals. From Jungle mynahs and bulbuls to robins and tree pies, the feathered friends rustle up a birdie concert while herds of Indian Gaur and a sounder of Wild Boar lay lazily like bundles on grassy dunes. The van enters the core area of the Mudumalai Tiger Reserve and we are greeted by a pair of young tuskers. Our guide M. Sahadevan, a tribal from the nearby Singara village tells us that the duo belong to a bachelor gang. “They are a herd of 16 and highly notorious for surrounding vehicles and charging at them,” he informs as we see the pair nonchalantly stride across the road, right in front of the vehicle, displaying their rotund masculine bodies. The localites identify elephants with their peculiar features and have even named a few. Sahadevan tells us about one such jumbo characterized by a pair of uneven but long tusks, referred to as ‘ Sub Inspector or S.I.’ by the villagers. The curvy forest roads takes us deep into the tiger reserve and all along we see herds of Gaurs and Chitals sharing their morning meal as a fine example of peaceful coexistence. Peacocks sit perched on rocks, preening their feathers. Herds of mother elephants with calves and lone tuskers greet us often but the big cats remain elusive. The guide asks us to keenly scan tree tops in search of camouflaged leopards. We try our luck in vain but the jumbos keep cheering us up with impromptu appearances. Hoping to return another time for the big cats, we carry back memories of the élan and gaiety of our ‘ele-friends’.